By now the spur on Snodgrass Hill has collected several batteries of artillery as well as stragglers from several regiments and brigades. 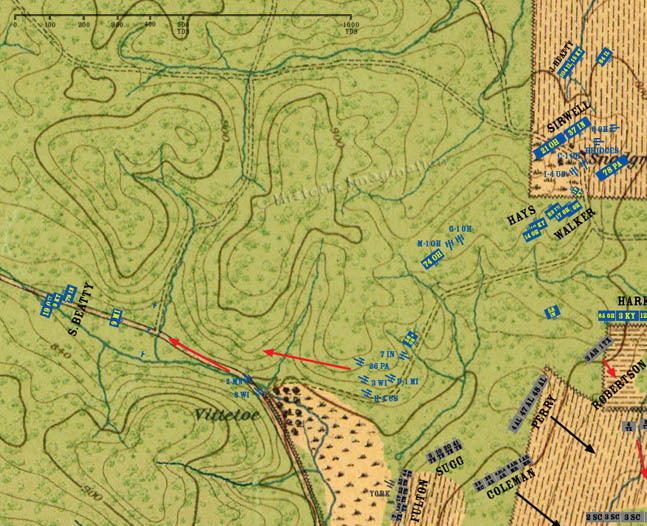 In addition, many ammunition and supply wagons not shown on the map are at the bottom of western slope of the hill. These wagons belong to many of the units fighting at Kelly Field. Fulton’s brigade crests a ridge overlooking the Vittetoe farm. Next to the farm, the Dry Valley Road runs through a gorge on the way to McFarland Gap. Fleeing Union troops clog the road, and the gorge acts as a natural bottleneck. Fulton calls up York’s Battery, and it shells the gorge. The cannon fire causes a panic and stampede in the already routed Federals. Sugg’s brigade links back up with Fulton.